2009 Winner – Oklahoma City, OK – Darwin Motorcycles, the builder of the Brass Balls Bobbers & Choppers motorcycles, is pleased to announce that its Custom Bobber received the 2009 V-Twin Bobber of the Year award at the annual V-Twin Expo, the industry’s largest trade show, held February 7-9 in Cincinnati, OH. Once a year, on Saturday night, the industry gathers in the Grand Ballroom of the Duke Energy Convention Center to celebrate the winners of the Excellence Awards given away by Paisano Publications. Dave Nichols, Editor-in-Chief of Easyriders Magazine brought Darwin Motorcycles founder, Dar Holdsworth, up to the stage and in front of his peers to receive the award. 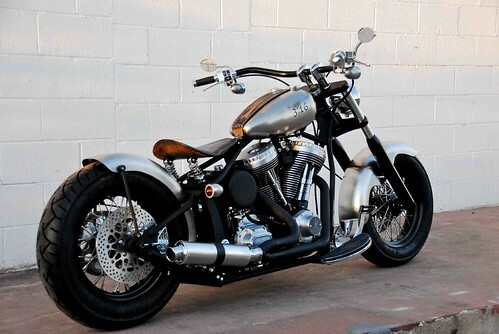 The award-winning Classic Bobber comes in a softail or rigid frame that is 36 degree, 0 up and 0 out. It sports a Mustang tank, floor boards, 140mm rear tire, sprocket/rotor rear brake kit and is available with a Harley-Davidson EVO, S&S 96 inch engine or Crazy Horse V-Plus motor. Motor of the Year: S&S Cycle KN Motor. 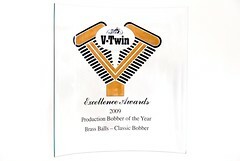 Frame Designer of the Year: V-Twin MFG. Wheel Designer of the Year: RC Components. Tech Product of the Year: Baker Direct Drive 7-Speed Transmission. Accessory of the Year: Klock Werks Flare Windshield. Performance Product of the Year: Zipper’s Performance Products For Thundermax G2 Closed-Loop EFI Controller. Teresi Prize- Innovative Product of the Year: Hoppe Industries’ Quadzilla Detachable Fairing. 2009 Bike Winners. Metric of the Year: Star V Star 950. 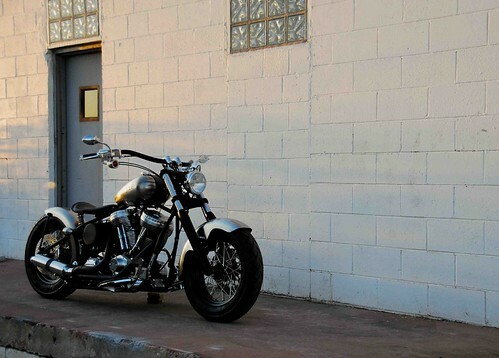 Custom Production Bike: Big Bear Choppers Model Paradox. 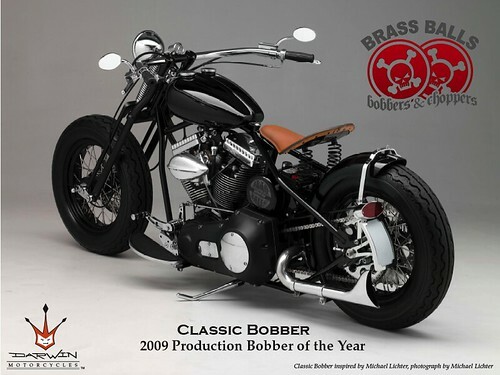 Production Bobber of the Year: Brass Balls Bobbers Classic Bobber. Cruiser of the Year: Harley-Davidson FLSTSB Cross Bones. Motorcycle Design of the Year: Harley-Davidson FL Series Powertrain and Frame. Bike of the Year: Big Dog Motorcycle Wolf. Darwin Motorcycles was created in June 2006 by motorcycle designer Dar Holdsworth. The firm has mastered the ability to fuse timeless old-skool bike styles with key racing designs. The company manufactures a range of custom bikes, including special one-off builds, choppers, and its Brass Balls Bobbers line. The Oklahoma-based custom bike manufacturer specializes in building a line of track-inspired quality bikes for the “average Joe.” The factory is located at 401 S. Blackwelder Avenue in Oklahoma City. Visit the company online at www.darwinmotorcycles.com. With a strong team at the helm and a slate of innovative, high-performance designs that blend vintage with contemporary, Darwin Motorcycles is primed and quickly becoming one of the leading motorcycle shops in the country attracting new riders and setting trends through their Above Average Bobber program. New Year. New Developments. Brass Balls Parts Line.